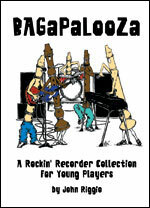 Here's another great recorder collection from John Riggio which includes six exciting original songs that require only the notes B-A-G. The recordings are exciting with styles right out of the Top 40, guaranteed to keep student interest high while they are learning. Hundreds of schools have already let us know how they feel about these tunes: They love 'em! Songs include: "BAG 101," "It's In The BAG," "Not My BAG," "BAGpipe," "Dr. BAG," and "Get Your Own BAG." Performance/Accompaniment CD included!